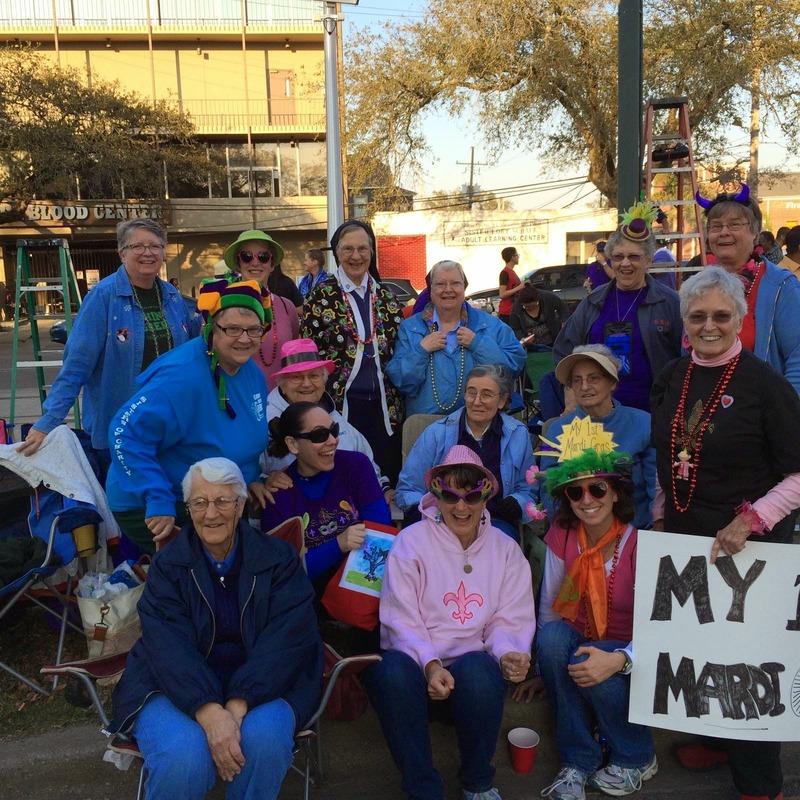 Sisters across the Federation gathered outside the St. Vincent de Paul Adult Learning Center on Canal Street in New Orleans for the Krewe of Endymion Parade. Several Daughters of Charity and the Sisters of Charity at the House of Charity, from Cincinatti, Leavenworth, and New York came together to catch some beads and Let the good times roll! If I were to share only ONE thing about Mardi Gras in New Orleans, it would be this: Mardi Gras is NOT, I repeat NOT, what you might hear about in the movies. The promiscuous tales of Bourbon Street where women do crazy things for beads is NOT the norm, but only a small, isolated reality for those who wish to travel down that road, because the parades do not even roll in the French Quarter. During my seven days of Mardi Gras celebration, I attended 20 parades, and never experienced any of the events most people, who are not from New Orleans, associate with Mardi Gras. So please, if this is all you read on the blog, PLEASE remember that Mardi Gras is not about taking off your clothes for beads. In my opinion, Mardi Gras is about building up community, one parade at a time. I experienced community with the people of New Orleans gathered together on the streets for the parades. It didn't matter if you were young or old, "rich" or "poor," black, white, yellow, or purple. All people gathered on the streets to share in this festival of comedy and tragedy. It was kind of like a glimpse of a New Orleans version of the Kingdom of God. During each parade, I immediately became friends with the strangers around me as we all stretched our arms out and screamed, "Hey, hey, hey! Throw me something mister!" Seldom did anyone fight over throws dispersed from the floats, and most of the time, there was sharing of items. Adults shared with children and children shared with each other. I was amazed by the generosity, kindness, and pure joy expressed between strangers who became friends as 20+ floats rolled by the crowd. I also experienced community with the Krewes who produced the parades and rode on the floats, sharing their unique traditions associated with Mardi Gras. Each Krewe and each parade had their own mission, values, purpose, and theme, and there was a place for just about anyone. There were women’s Krewes like Nyx, Muse, and Iris. There were super Krewes like Endymion with 3,100 members and elaborately decorated light-up floats. There was the humorous Krewe of Tucks, originally started by college students and known for throwing toilet paper. There was Thoth, known for parading past the Poor Clare Monastery, Children’s Hospital, and Home for Disabled Adults, ensuring that all people, even those unable to make it out to the streets, were able to experience a taste of Mardi Gras. And there were also the traditional Krewes of Zulu and Rex, who take over the city on Mardi Gras Day. Each Krewe put on a show for the city in their own unique ways, and I appreciated diversity that each Krewe contributed to the Carnival Season. 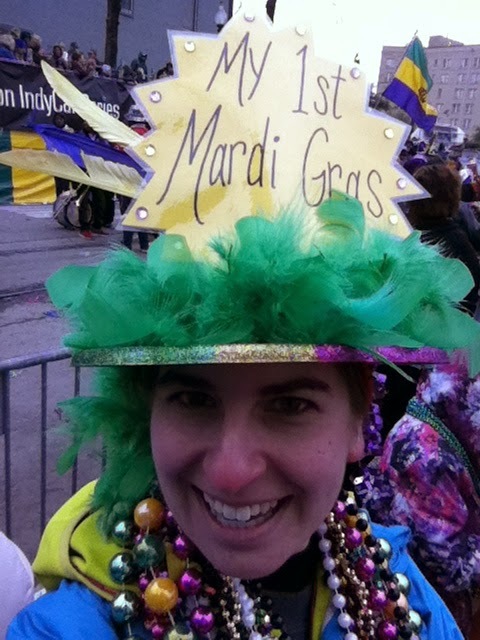 Finally, I experienced community with the Sisters gathered with me at the parades. Whether you were a local Sister, born and raised in New Orleans, or a Sister newly missioned to the "Big Easy," all appreciated Mardi Gras in their own ways. Some Sisters danced the “Cupid Shuffle” in the street, and others laughed over finding the plastic baby in the King Cake. Some Sisters attended the parade with their coifs (veils), and others were in full Mardi Gras attire. Some people might be surprised to hear that Sisters celebrate Mardi Gras, but once you have a proper understanding of what Mardi Gras actually is, it makes sense for Sisters to be right there in the streets with the people. So my friends, this was my attempt to write a brief reflection on my Mardi Gras experience in New Orleans, but really, words cannot adequately express how I encountered Christ in community with the people gathered in the streets, the Krewes in the parades, and the Sisters who celebrated the season with me. I will leave you with the unofficial Mardi Gras theme song, so grab your parasol and your beads, and let’s Second Line to Ash Wednesday! 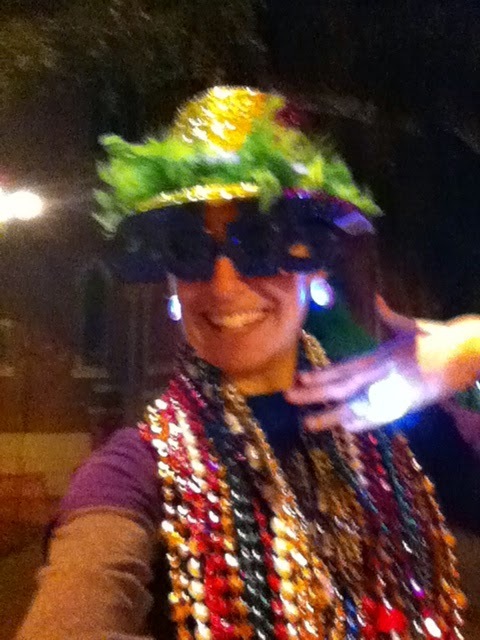 …and during the last parades of the Mardi Gras Season.